A mostly man-made city park with a lake and an asphalt trail. There are also some shorter trails in a wooded area. Terrain / Scenery: Lake and open grassy areas with a small wooded area. Fees / Permits: Confusing fee system for some parking areas and lake access. Trail Conditions: Wide asphalt multi-use trail around the lake, wide natural surfaced or wood chip trails in the woods. .
Facilities: Various fee or membership facilities including beach and RecPlex..
Getting There: Located west of Kenosha, Wisconsin in the city or Pleasant Prairie. The main park entrance is on State Highway 165 about a mile east of I94. There are a few things about this "suburb" park that rub me the wrong way. First of all, most of this park was created with bulldozers. Everything from the lake (Lake Andrea), the landscaping, and asphalt trail around the lake are all way too planned and new for my tastes. Then there's the massive RecPlex located in the park and the fenced-in beach area (I'm probably nitpicking on the beach area). But what irks me the most are the unwelcoming and confusing parking rules. There are signs scattered throughout the park that state all parking areas within the park are for annual members only, but not all parking lots have these signs. As best I can make it out, all parking lots along the southwest, west, and northwest areas around the lake are for "members only". You cannot even purchase a day pass for these lots. So where do non-members park? According to their website " Non-park pass holders must park on the street." It doesn't say which street and some park roads and Highway 165 are signed for no parking (even though there is plenty of room). There is a wider section of park road on the south side of the lake that is not signed, so my assumption is this is where outsiders can park. I'm thinking there may be other areas where outsiders can legally park (possibly including some sections of the larger parking lots near the RecPlex) but it's almost as though they prefer to keep that a secret. Lake access is also confusing. I believe there is a fee required if you want to windsurf the lake but not for other watercraft use??? There is a public boat launch at the north end of the lake, but there is another launch area within the park that requires a fee for launching/parking. Boats can only use electric motors on the lake. The wide open virtually treeless area around the lake results in a rather windy lake that is great for windsurfers but not so good for a canoe. Speaking of canoes and Pleasant Prairie's affection for no parking rules, up until recently canoeists would park on the grassy hill off of Highway 165 at the Des Plaines River to use this as a launch area for canoes. I've been doing it for 20 years. Well apparently upon realizing that people were recreating in Pleasant Prairie in a way that doesn't involve paved pathways or Recplexes and was not part of what Pleasant Prairie understands as recreation, they put up a shiny "NO PARKING" sign right in the grassy area to stop this hooliganism. I guess it should have been clear years earlier when they built that rather low pedestrian bridge across the Des Plaines River that they didn't exactly understand that some people would choose to paddle the wild natural river rather than their engineered lake. There is a 2.3 mile asphalt pathway that circles the lake. The area around the lake is made up of wide open mowed grassy areas. There is very little here that looks natural. To be fair, this is a new city park and may not be any less natural than other city parks were when they were first established decades ago. I think the location of this park (adjacent to the Des Plaines River floodplain) makes me expect more out of it. The redeeming value of this park comes from the wooded area (this area was actually made by nature) at the west end of the park. This wooded area borders the Des Plaines River and has a series of interconnected trails running through it. You're not going to put on many miles here but the trails are nice for an occasional walk. They certainly feel a world away from the nearby asphalt path around the lake (as you can see by the two photos above). There is small observation deck overlooking a wetlands area at the north end of this wooded area, and on a nearby trail there is a bridge that crosses the River (but doesn't go any where from there). I'm quite certain that the vast majority of park users have no idea these trails are here and that's just fine with me. These trails are wide natural surfaced (or wood chips) double-track. You will find some narrower sections that extend down to the river floodplain (the main trails are all on higher ground). If you're looking for asphalt trails, scenery, and lake access without all the "members only" attitude, I suggest you visit the Kenosha city parks along Lake Michigan. The scenery is better and the parking is free and plentiful. And that even goes for residents of Pleasant Prairie. The Prairie Farms Trail is a new (as of 2013) crushed-stone bike path that runs North from Prairie Springs park to County Highway C just west of Bain Station Road. The trailhead is just off of the park road at the North end of the Park. I show the trailhead and a portion of the trail on the map on this page (in Brown). 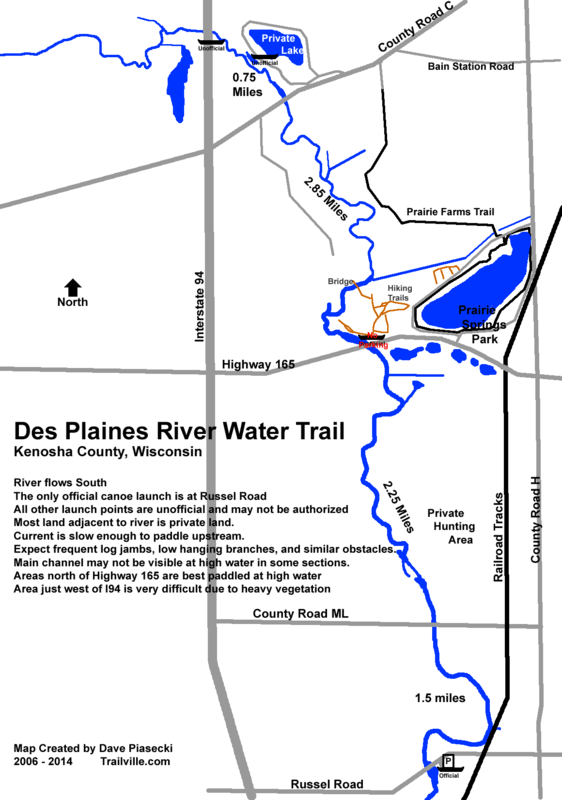 I show the entire trail on my Des Plaines River - Kenosha Map. The trailhead at the North end is at the end of a dead-end road. The road doesn't seem to have a name, but it is the first road southeast of Bain Station Road on Highway C. The Road dead-ends at a fenced area, the smaller gate on the right (south) is the bike path (they didn't have a sign there the last time I rode it). I didn't measure, but I would guess the entire trail is only about 2 miles. For the most part, the trail is bordered by farmland on the East side, and the Des Plaines River Flood Plain on the West (you won't actually see the river). Nothing particularly exciting about this trail, but if you live near the North end of the trail, it would be a very convenient means of getting to Prairie Springs Park. This page was last modified on 22 June 2014, at 17:13.